Center for Sustainability has raised $ 11,857 from 123 gifts! With your support, we can create a more sustainable future. 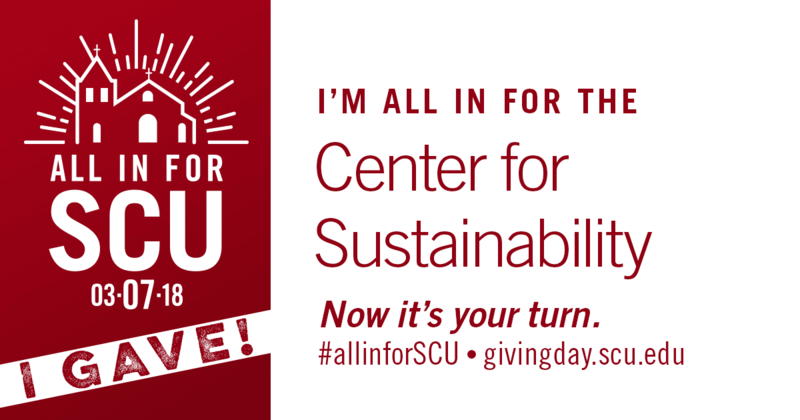 ARE YOU ALL IN FOR THE CENTER FOR SUSTAINABILITY? YOU can help build momentum for the causes you care most about by saving the image below and sharing it on your social media sites to show your Bronco pride! SCU understands climate change is human-caused, it’s happening now, and it’s already affecting many of us, especially the underserved. SCU has a bold climate commitment and is a member of the We Are Still In initiative - we stand by the Paris Climate Agreement and are committed to meeting its goals. Thank you so much for going all in for a Sustainable SCU; you are part of a worldwide turning point in history. Your support helps the Center for Sustainability empower SCU students, employees, engaged alumni and community members understand their role in building a resilient, regenerative world. Our goal is for the entire Bronco family to be ambassadors for sustainability - equipped with knowledge, skills, and desire to build a more humane, just, and sustainable world. Bronco Urban Gardens (BUG) is a food justice outreach initiative that works in solidarity with marginalized neighborhoods, to support their urban garden projects and spaces and to create hands-on learning experiences for students of all ages and backgrounds, including SCU students. Build out the Gardner Academy garden space and programming. Support Garden Clubs at Washington and Gardner to increase number of days each week our school enrichment is provided for youth. Develop BUG Internship program for SCU students interested in public health, early education, human services and environmental education. The Forge Garden is a 1/2-acre, educational garden and SCU’s hub for sustainable food systems education and works with all academic departments across the University to engage in interdisciplinary discussions and workshops related to our food system and beyond. Develop The Forge Garden’s outdoor kitchen by purchasing supplies and materials including a commercial refrigerator. Develop rainwater harvesting systems to reduce water needs at the garden. Provide funds for student internships and other student engagement opportunities. Programs of the Center for Sustainability help the University achieve climate neutrality, foster mindful consumption practices, strengthen a campus culture of sustainability, and utilize the campus as a living laboratory for developing global solutions. Boost SCU’s climate mitigation and adaptation efforts: increase renewable energy generation and expand efforts for carbon neutrality and resiliency planning. Expand student internship opportunities allowing students to catalyze change in areas like sustainable food systems, carbon neutrality, waste minimization, urban forestry. If there are at least 75 gifts made to the Center for Sustainability on the Day of Giving, an anonymous donor will contribute an additional $3,000 to the Forge Garden this year.